System for frost and frost free locations. 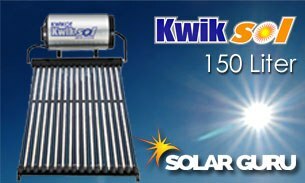 The 150 Liter Kwiksol High Pressure Solar geyser is designed to be installed in locations where frost occurs and where the ambient temperature falls below 5º C and where the water quality is poor (more than 600ppm Total Dissolved Solids/Minerals). The potable water in the solar water heater remains in the inner tank. Propylene Glycol diluted with water is used as the heat transfer fluid and is held in a separate chamber within the solar water heater and circulates through the solar collector panels or manifold of any array of solar vacuum tubes installed outside on the roof, transferring solar energy. Propylene Glycol does not freeze and therefore protects the solar collector panel/s from freezing and damage. 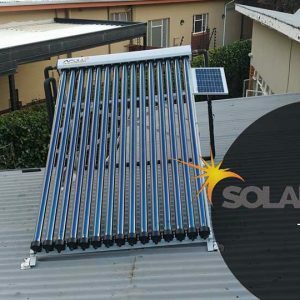 The solar water heater indirect system can be installed as a Split System using pumped or thermo-syphon circulating methods, or as a Close Coupled System using a thermosphon circulation method. 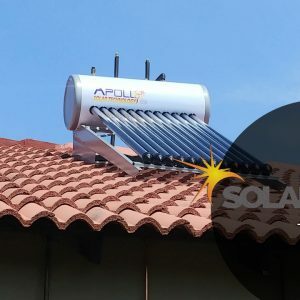 The solar water heaters indirect system, also work as a conventional electric water heater and are fitted with a Kwikot Solar Element and Kwikot Kwiktherm Thermostat. The element is designed to heat half the volume of water electrically, leaving the balance to be heated by solar energy by means of the solar collector panel/s or solar vacuum tubes. The solar water heaters are IPX4 rated. 5 Years on the inner cylinder from date of installation or alternatively from date of manufacture, if the installation date cannot be proven and subject to water conditions equivalent to main metropolitan supply authorities. 1 Year on the electrical heating element, thermostat, flange assembly plate and gasket.